The Inner Hebrides of Scotland. Looking west to Balephuil Bay, Tiree across the machair. The Inner Hebrides is an archipelago off the west coast of Scotland, to the south east of the Outer Hebrides. Together these two island chains form the Hebrides, which enjoy a mild oceanic climate because the Gulf Stream runs past them. There are 36 inhabited islands and a further 43 uninhabited Inner Hebrides with an area greater than 30 hectares (74 acres). The main commercial activities are tourism, crofting, fishing, and whisky distilling. Combined, the islands have an area of approximately 415,800 hectares (1,605 sq mi), and had a population of 18,257 people in 2001. The population density is therefore a little over 4 persons per km2 (11 persons per square mile). There are various important prehistoric structures, many of which pre-date the first written references to the islands by Roman and Greek authors. In the historic period the earliest known settlers were Picts to the north and Gaels in the south. The islands became part of the Kingdom of Mann and the Isles, the Suðreyjar kingdom of the Norse. The Norsemen ruled for over 400 years until sovereignty was transferred to Scotland by the Treaty of Perth in 1266. Control of the islands was then held by various clan chiefs, principal of which were the Clan MacLeod and Clan MacDonald. The Highland Clearances of the 19th century had a devastating effect on many communities and it is only in recent years that population levels have ceased to decline. Sea transport is crucial and ferry services operate between the islands and the mainland Britain. 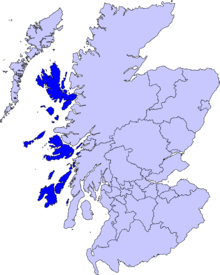 The Gaelic language and the Wee Free Church of Scotland remains strong in some areas. The landscapes have inspired a variety of artists, and there is a diversity of wildlife. Skye, Mull and Islay are the largest islands. There are also many small, uninhabited islands. One of the uninhabited isles, Staffa, is home to Fingal's Cave and basalt columns. ↑ General Register Office for Scotland (28 November 2003) Occasional Paper No 10: Statistics for Inhabited Islands. (pdf) Retrieved 22 Jan 2011. This page was last changed on 6 August 2018, at 14:20.